Greetings and Salutations! 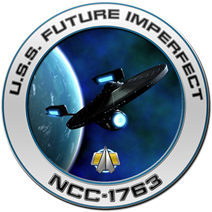 Welcome to the home of the USS Future Imperfect. The USS Future Imperfect, a Constitution Refit Class Starship (Enterprise II subclass), is a correspondence chapter of STARFLEET International. 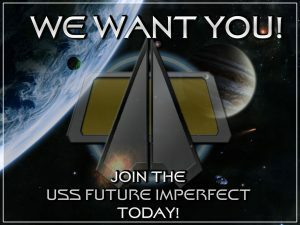 The USS Future Imperfect is a non-profit chapter of science fiction fans, gamers, and podcasters across Region 13 which includes Michigan, the U.S. and parts of Ontario, Canada. We love all science fiction, not just Star Trek and are huge geeks (Seriously google the CO and XO)! Our goal is to make new friends, share our interest in science fiction and have a good time doing it! Through our membership in the USS Future Imperfect, and our parent organization STARFLEET, The International Star Trek Fan Association Inc., we have come to meet many people over the years, some of which have become our closest friends! Interested in More? Then Join STARFLEET Today!